If you are a financial analyst, you must be looking out for a deserving position in the industry. 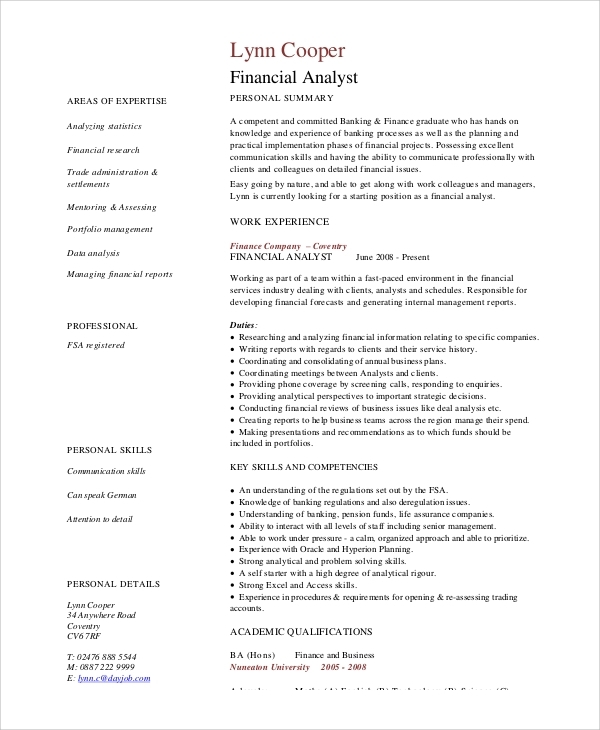 When you reach out to the companies to get recruited, you need a killing Financial Analyst Resume that streamlines your profile. A Sample Resume is necessary to showcase your professional skills, academic qualifications and justify why you are suitable for the job. Here are some sample resumes customized for your profile, and you may choose any of these formats for developing your resume. 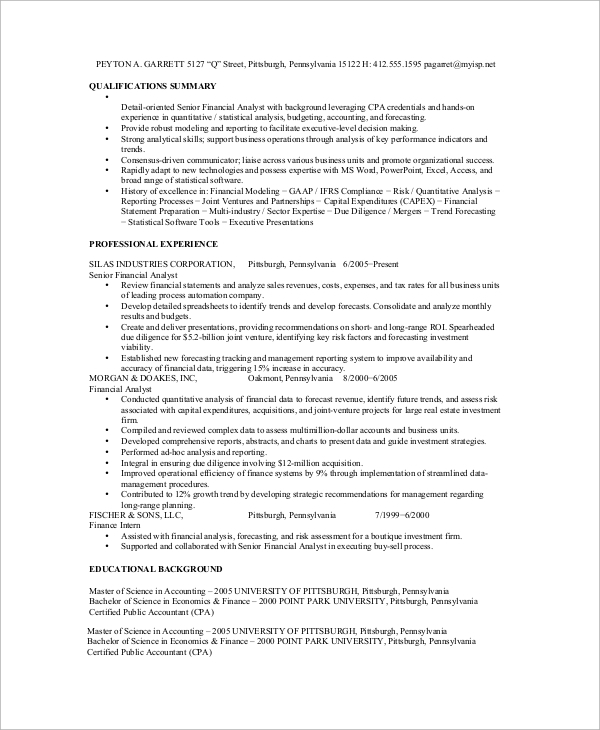 This resume starts off with the name of the candidate and the contact information. The core qualification skills are summed up in brief. Then the experience and educational qualifications are included in the resume. 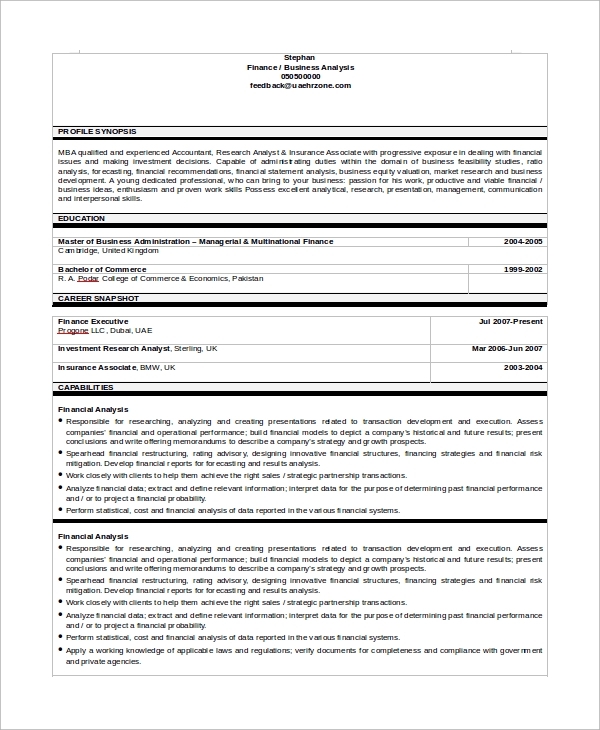 This resume has the qualification summary and professional experience formatted in bullet points in the first two sections. You can be detailed with these aspects, and then include other abilities and attributes relevant to the job. 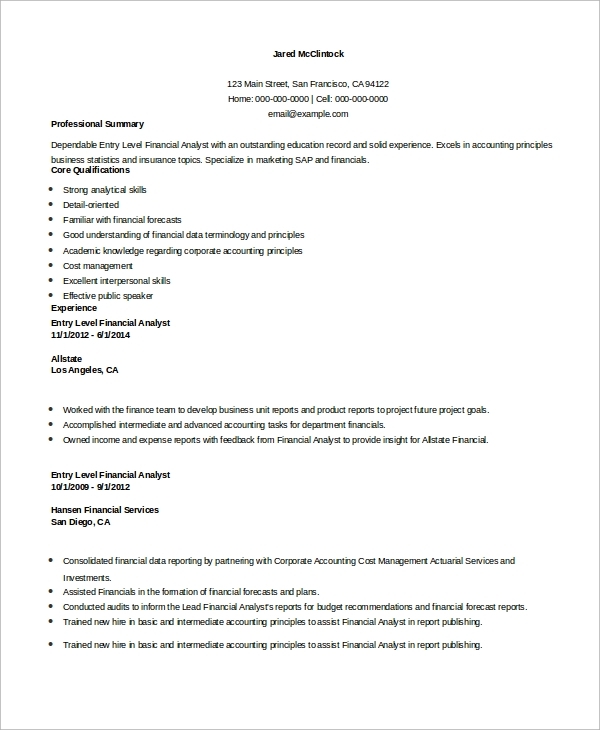 You can also see the Finance Resumes. If you are experienced enough, start off with the abilities and professional hallmarks. Include the qualifications and personal skills after that. 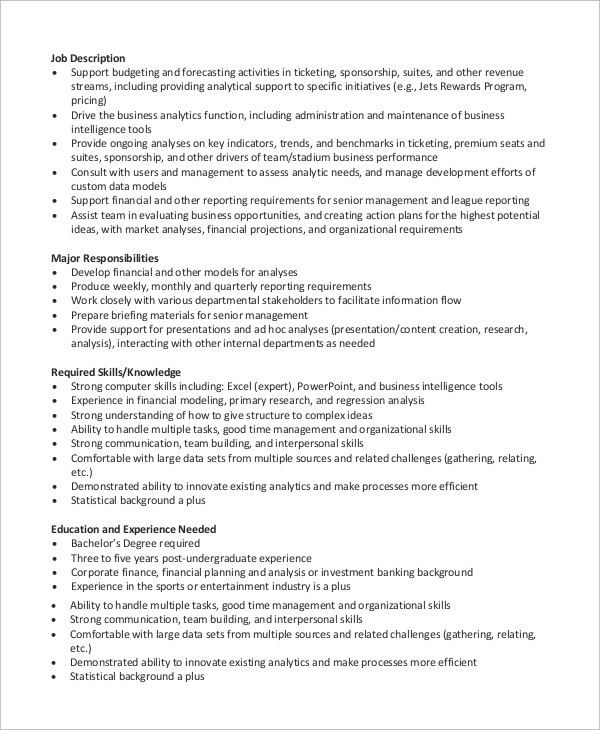 You can use a proper mix of paragraphs and points in this resume. 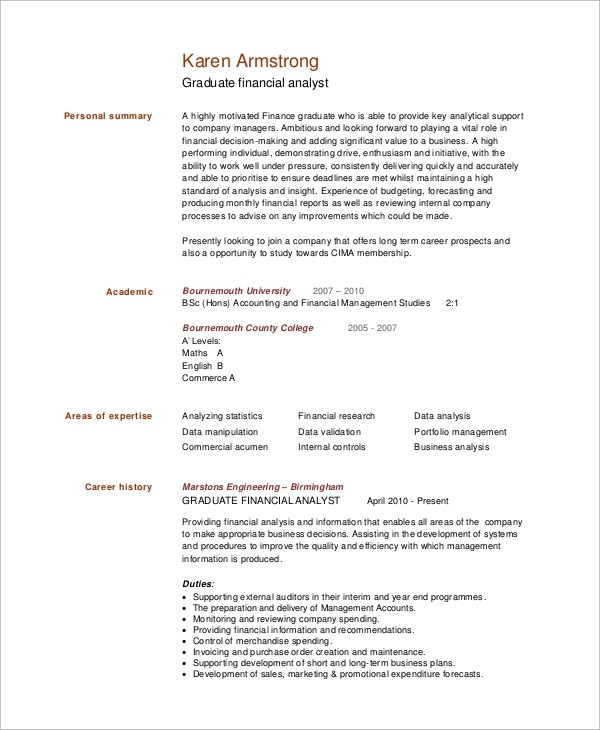 Why is a Tailored Resume Crucial for a Financial Analyst? 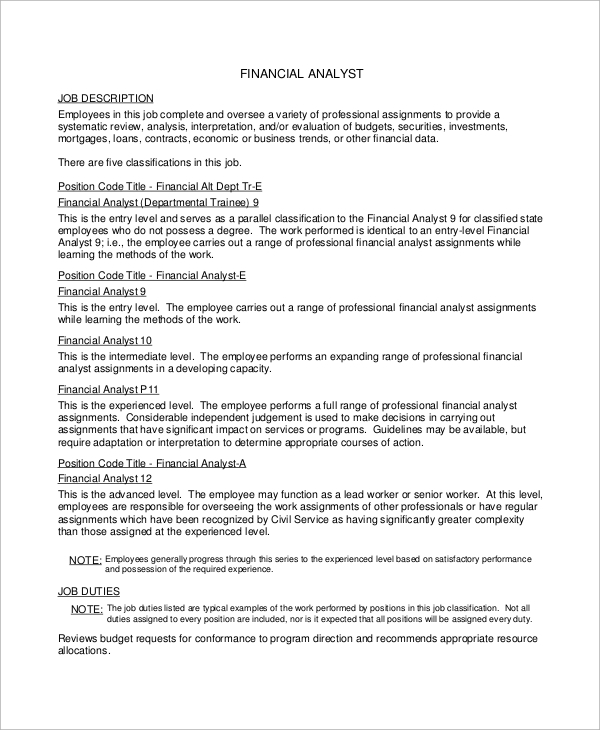 A Sample Financial Analyst Resume is an account of the academic and professional achievements of a candidate, lucidly explaining what makes him or her different from the rest of the candidates. In a nutshell, you need to include all your qualities and abilities in the resume. Financial analysts have to shoulder a lot of responsibilities related to the economy of a company, and there are neck-to-neck competitions among deserving candidates. These positions are lucrative enough, and the leading companies offer excellent salary packages. So, you may have realized why you need a tailored resume. It is a way of selling your talent in the competitive job market. This is a typical resume with the relevant details, explaining why a candidate is suitable for the position. You can include your educational qualifications, job experiences and other aspects in separate sections, each under a sub-head. Here, you can start off with a brief personal summary, where the key attributes are summed up in a few crispy lines. Then you can move on to the academic expertise, certifications, and work experience. What Information Should You Include in Your Resume and How? When you apply for the post of a financial analyst Resume Examples in a particular company, you need to showcase your skills. So, be precise with the experience you have gathered over the years. When you mention the companies you have worked with, mention the profile as well as the time you were associated with them. Along with this, you can include other soft skills that are relevant to the job. It is wise, to sum up your abilities and uniqueness in bullet points so that the employer finds it easy to comprehend your potentials. Include the contact information in a conspicuous manner, so that you are easily reachable. When you find a Financial Analyst Job Description in an online recruitment portal, you need to be diplomatic with the resume, so that you can pip over your competitors and find your position in a top company. There are various Resume Samples in the website, formatted in some patterns. You are free to customize them as and when you require.